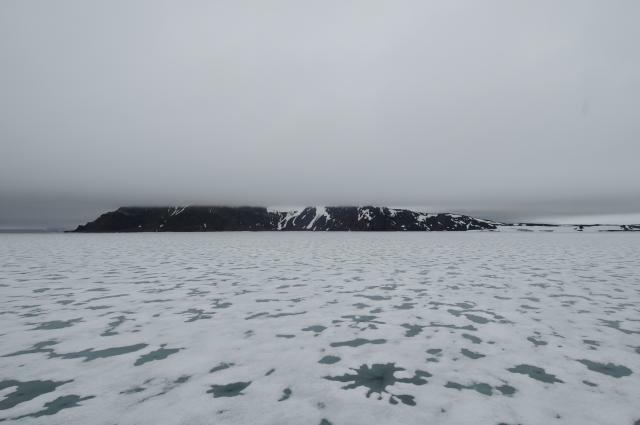 Our first landing in Franz Josef Land would be on Ziegler Island. We had intended to land on Payer Island, but heavy fog prevented helicopter operations, so we diverted to Ziegler Island instead. 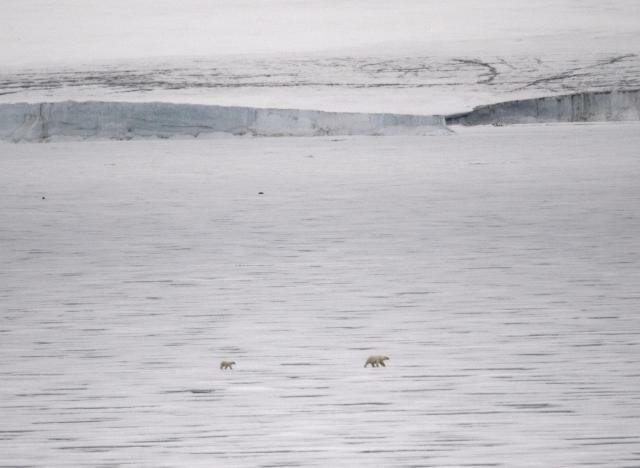 While approaching the island, a female polar bear and cub were spotted on the sea ice between the ship and the island. This was to be our last polar bear sighting. 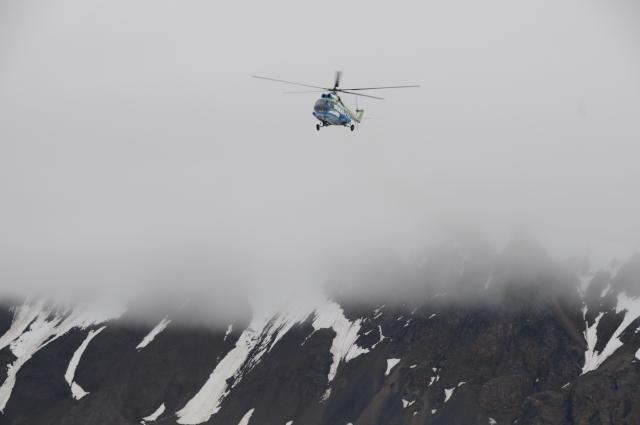 Ziegler Island is visible across the ice as helicopter transfers from the ship began. Note the round holes in the melt ponds in the foreground. 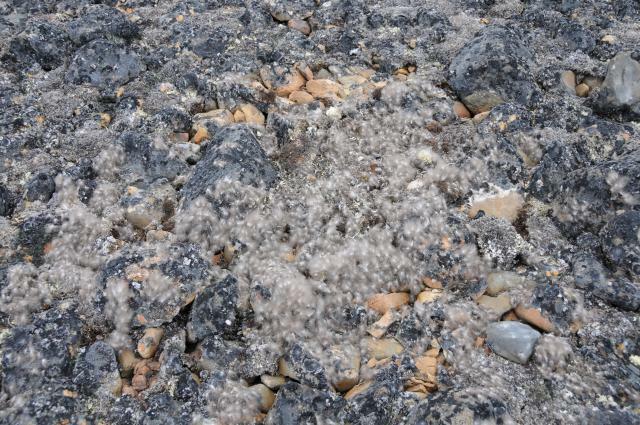 These are breathing holes used and maintained by seals. The polar bears we saw above were patrolling these holes in search of a meal. The helicopter returns from delivering a batch of passengers before picking us up for our trip to the island. 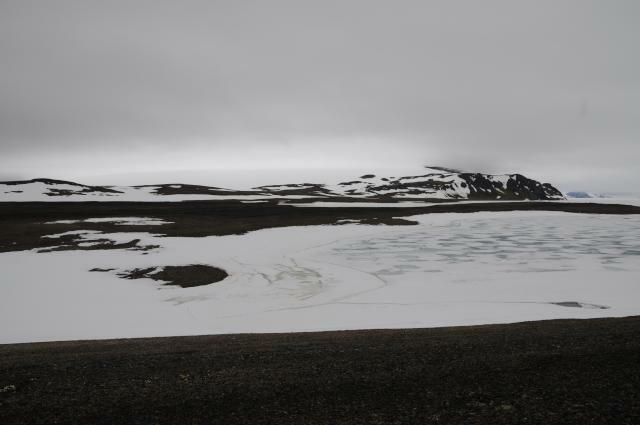 After landing, the first impression of the landscape is its apparent bleakness. 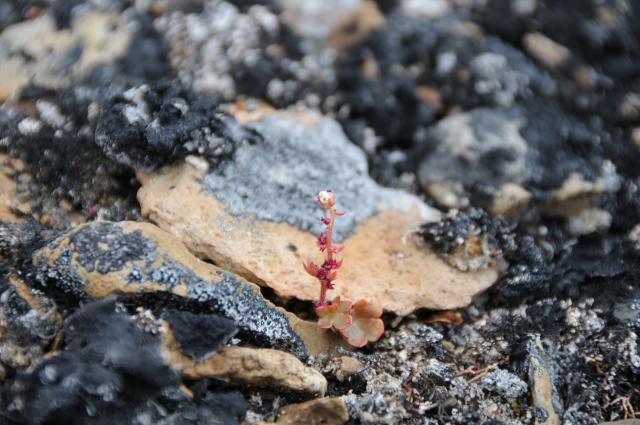 But when you look closer, there is life everywhere. Note the colours among the dark volcanic basalt rock. 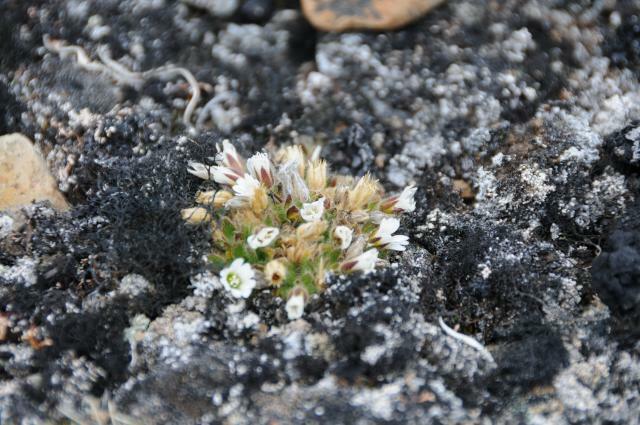 These are lichens and wildflowers we'll see in more detail below. 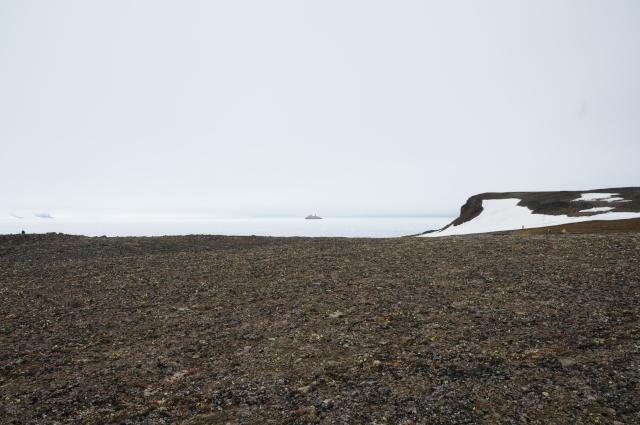 The containers at the left were brought to the island by an Austrian film production company making a documentary about the Payer-Weyprecht Austro-Hungarian North Pole Expedition which discovered Franz Josef Land in 1873. 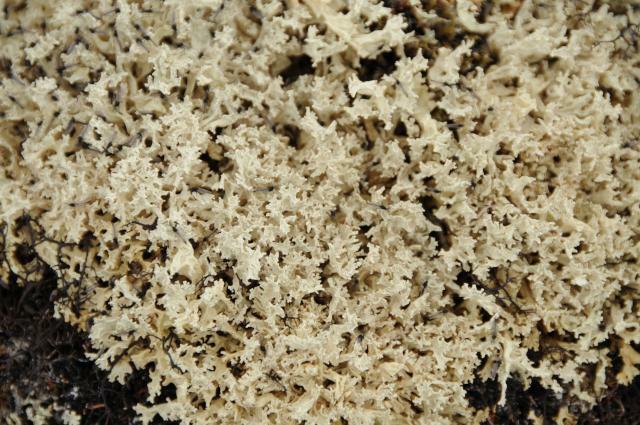 So-called “reindeer moss” (Cladonia rangiferina) is abundant on the island. 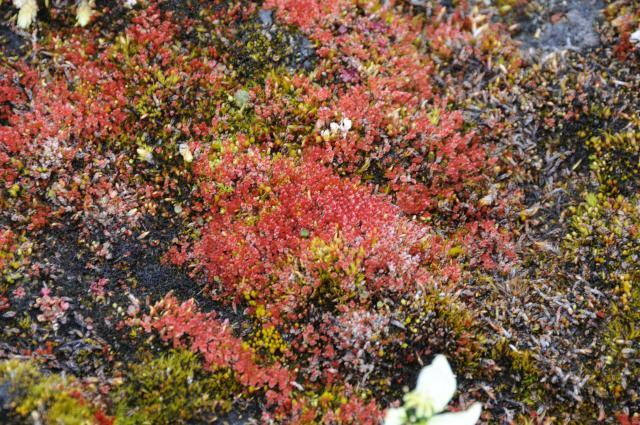 This is actually a lichen, not a moss, and is not eaten by reindeer in Franz Josef Land because none inhabit the archipelago. 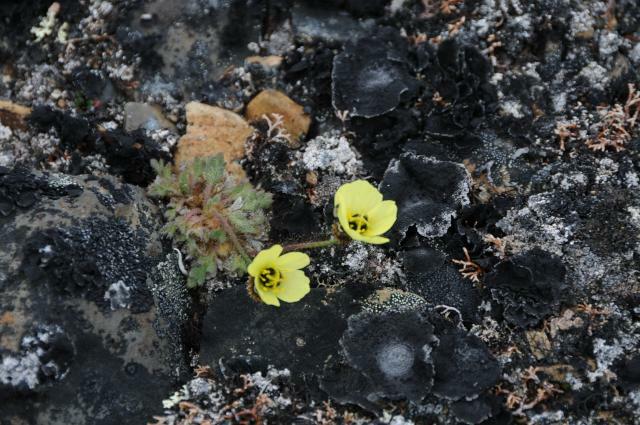 The arctic poppy (Papaver radicatum) is one of the most prolific plant species in Franz Josef land. The flowers, which track the Sun as it moves in a helix in the Arctic sky, give a yellow cast to slopes with soil in which it prospers. 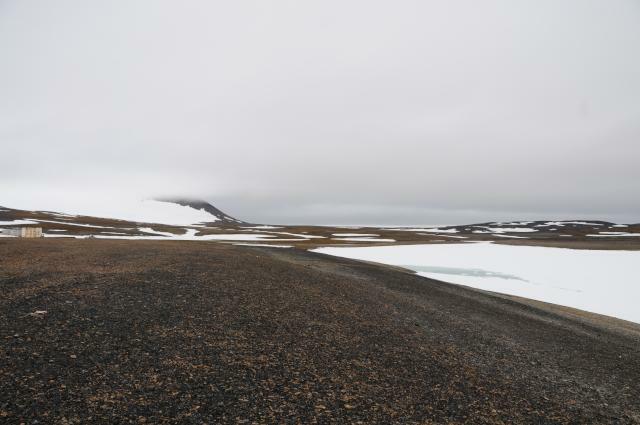 These extreme Arctic environments are all about microclimates. 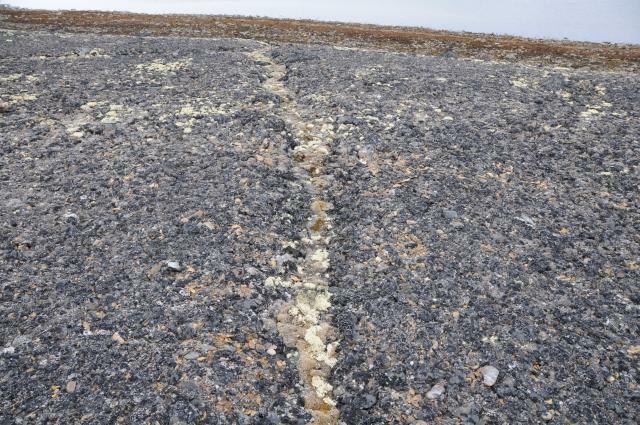 Note how this trench, shielded from the wind and supplied by meltwater from winter snow, is host to reindeer moss and other flora which are sparse in the surrounding rock. Looks like a seal had a really bad day here. I'd put it down to a polar bear. These plants are tiny—I'm sorry I didn't bring anything on this landing to provide a distance scale; on subsequent visits to the islands I used a 1 Euro coin to provide a sense of scale. Look at the arctic poppies in bloom on the slope before us and in the distance. The containers from the movie crew are visible on the other side of the lake. The ship is visible in the distance. 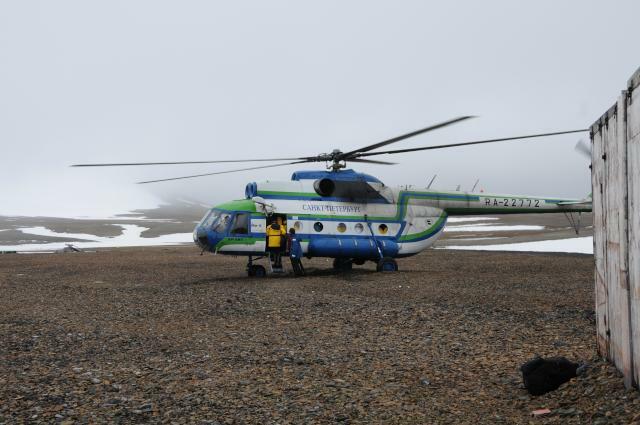 After delivering everybody to the island, the helicopter stands down for a hour or so to refuel, and then begins shuttling people back to the ship. 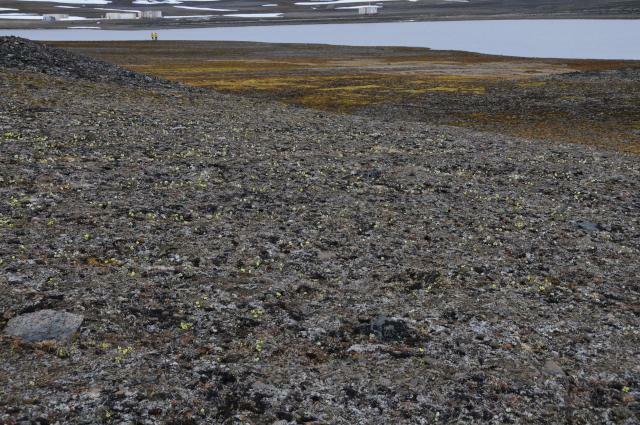 All of the yellow dots are arctic poppy flowers. I'm pretty sure this is a saxifrage. 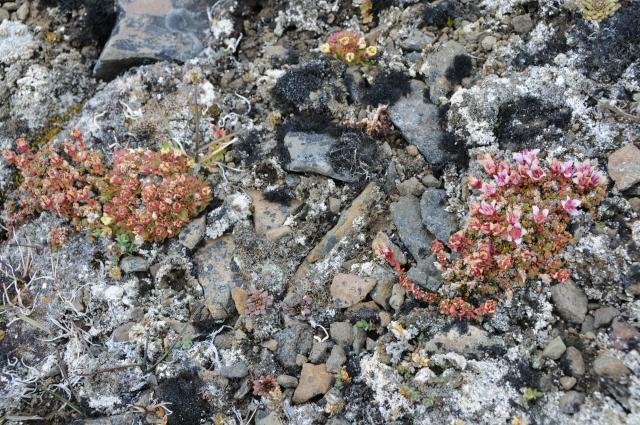 I'm not certain about the species, but it looks kind of like a purple saxifrage (Saxifraga oppositifolia) which is common in the high Arctic. 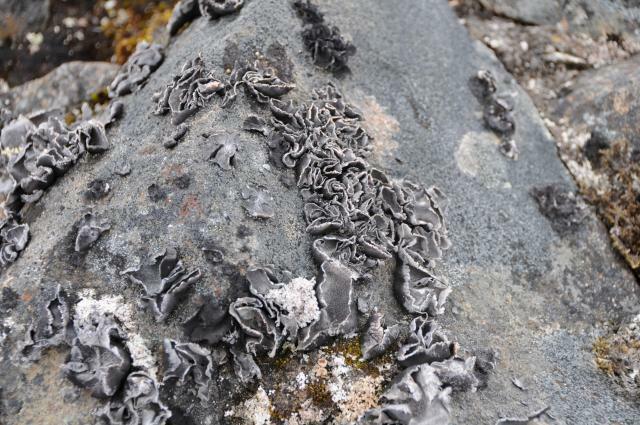 Lichens are among the hardiest lifeforms on our planet, and they are abundant in the Arctic. 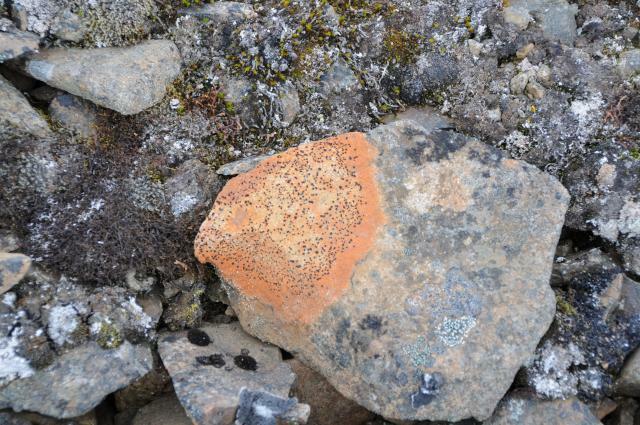 This rock is host to a variety of lichens. 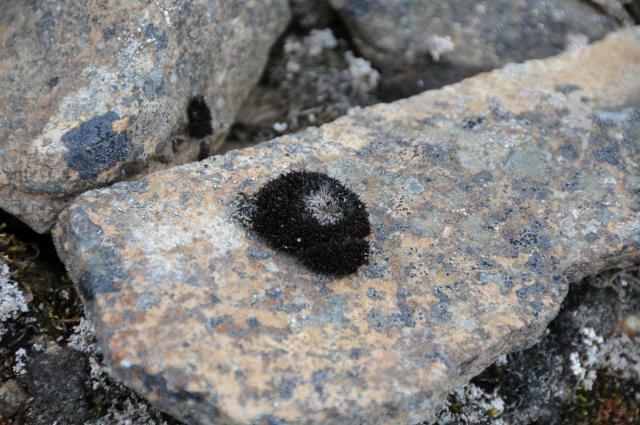 These furry little critters are everywhere. They look like spiny tribbles, but I'm pretty sure they're lichens. Wow! 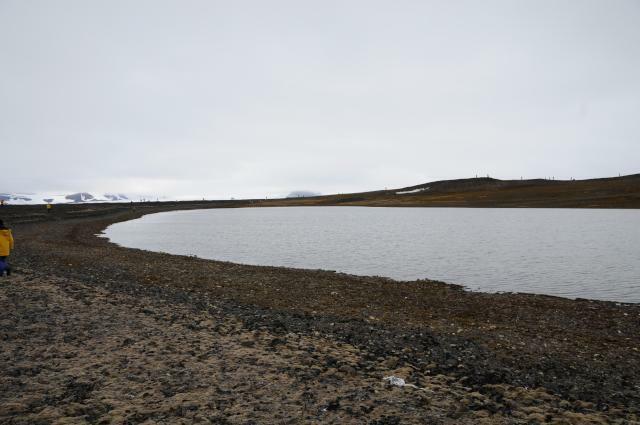 They said the Arctic was barren, but look at this. 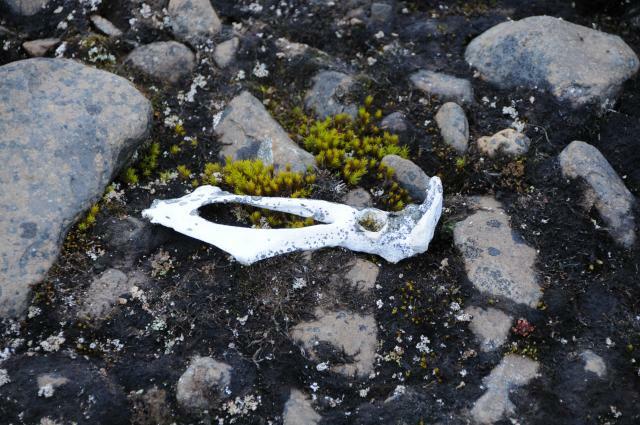 Another lichen, of course. What's this? 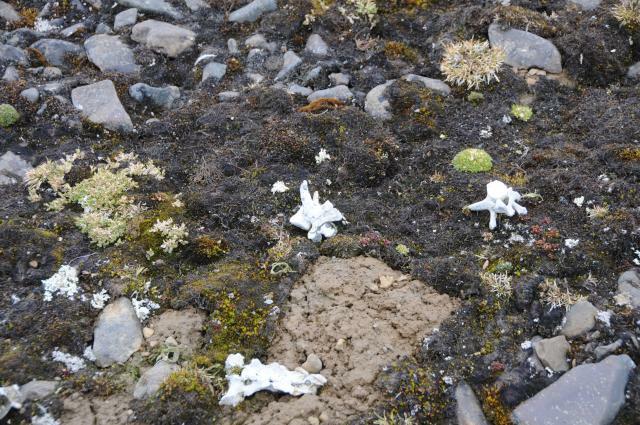 No, it's not some kind of fungus, but Arctic cotton grass (Eriophorum scheuchzeri), a sedge which grows in boggy areas formed by meltwater in the Arctic summer. Time's up—farewell to Ziegler Island and back to the ship.